Huh? We like to think we know what’s what around the state (you can read about our explorations of Cleveland and Cincinnati), but we were positively stumped by this – we genuinely hadn’t heard the first thing about this restaurant, nor had we a clue as to where it might be. So, the rundown: Revolver is in Findlay, OH, and is owned and operated by Chef Michael Bulkowski. Bulkowski is a veteran of the kitchens of several celebrated Chicago restaurants (including Trio, where he worked alongside Grant Achatz of Alinea), and after 8 years of working for others moved Findlay to open Revolver. “…i am returning home(findlay) from an 8 year stay in chicago. i had considered opening in chicago but having a daughter just starting school, so my wife and i felt returning to ohio to open would be the best decision for all. also the benifits of opening in small town ohio i.e. start up costs, less competition, no need for investors. Needless to say, we couldn’t resist making the trek to Revolver. Since the two-hour drive meant we probably wouldn’t be returning soon, we wanted to do it right, and arranged for a 7 course tasting menu. Which, with one exception (that we’ll mention later), thoroughly justified the buzz surrounding the place. We’ll save you the blow-by-blow of describing every course we tried, and focus on a selection that showcases Revolver’s range and subtle inventiveness. 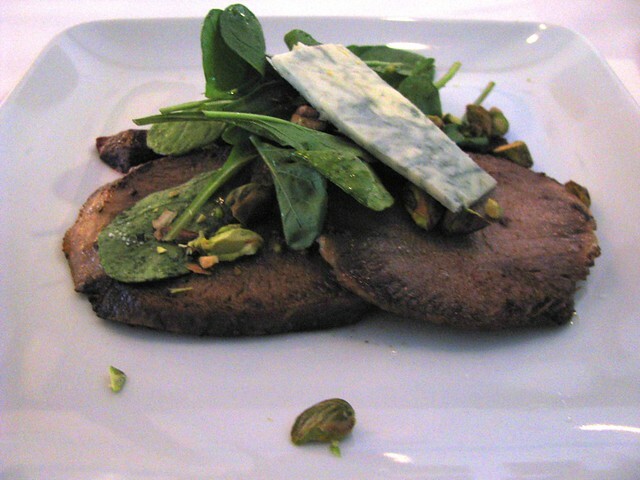 First up, the pickled cow’s tongue with candied pistachios, arugula, and blue cheese. This dish entirely confounds expectations – ‘pickled’ generally implies preservation through the use of vinegar or other acidic solution (not to mention being served cold), and ‘tongue’ of any sort fairly shouts ‘gamey’ and ‘chewy’. Forget all of that. There was no hint of acidity whatsoever (I’d guess the tongue was pickled using a salt brine), and the generous slices were served warm, nicely seared and were easily as tender as a filet. The dominant flavor was of a rich beefiness that was every bit the equal of the best steaks I’ve had. A carefully constructed bite, with a bit of blue cheese, was perfection. Next, the sweet onion bisque. 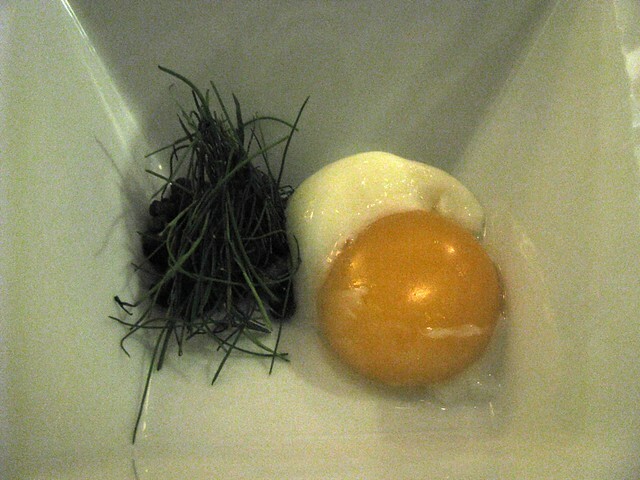 We were presented with a bowl, at the bottom of which was a perfectly poached whole egg, some fried pancetta cubes, and microgreens. Our server poured the bisque over these at the table, completing the dish. First thought – fried pancetta makes for a perfect meat crouton. Second thought – this sweet onion bisque is surprisingly subtle, bright, and wonderfully creamy. Third – a soup as rich as a bisque may not exactly be wanting for added egg yolk, but it sure doesn’t hurt! Furthermore, Revolver’s presentation of this dish cleverly solves an interesting problem of presentation, as the bisque itself isn’t overly visually appealing – were it served complete, it’d fail to impress prior to tasting. Served as described, however, it seduces completely. Finally, the hoisin-glazed duck breast. Revolver’s kitchen relies heavily on sous vide (vacuum bagging and immersion in temperature controlled water) for protein preparations, and I can’t imagine it being used to better effect than with this dish – especially since duck is a meat that is best served medium rare, which is particularly difficult to achieve using traditional methods. The result was that this was, without a doubt, the most tender and most flavorful duck I’ve ever tasted. 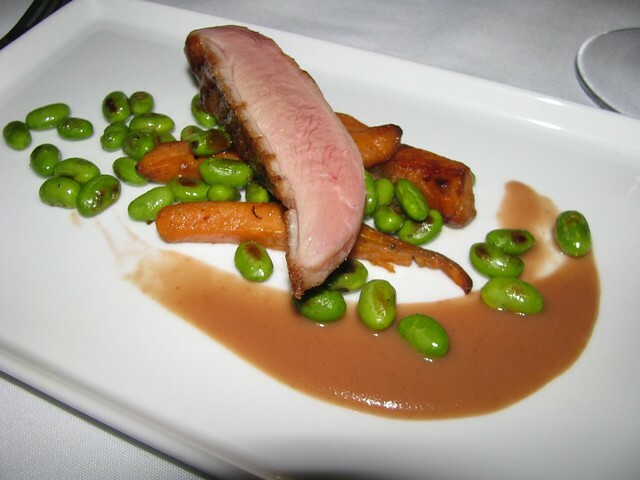 Consider the elements of this dish – edamame (soybeans), duck, and sweet potatoes. As with all of the other dishes we tried, the individual ingredients are all pretty straightforward, and they’re all foods that can easily be found locally. This, of course, is the key to Bulkowski’s approach – find the best of what’s local and in-season, and prepare it in such a way as to show off the quality of these ingredients using impeccably refined ingredient-appropriate techniques. As such, the menu is notable for what a restaurant of Revolver’s repute doesn’t have – you won’t find fist sized lobes of foie gras or haystacks of shaved truffle. You won’t miss them, either. Nor will you find prices consistent with such luxury items – apps range from $3 – $9, and entrees from $17 – $26 (with the Allen Brothers dry-aged ribeye breaking that range at $45). Suffice it to say, we heartily agree with our friend – Revolver easily ranks among the best restaurants in the state. Our only quibble was with the desserts (we tried 3) which were solid but clearly not up to the level of all that came before. Note – We apologize for the poor quality of the photography. The lighting at Revolver was not conducive to generating quality imagery. 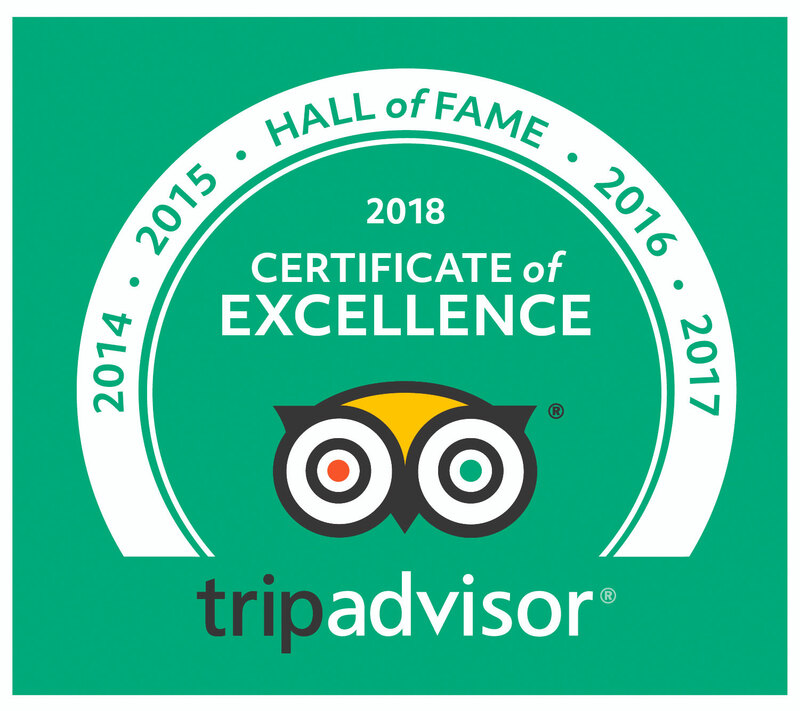 Revolver is thrilled to announce that Chef/Owner, Michael Bulkowski, has been included as a nominee for this prestigious award, and we are enlisting the help of our valued customers. Now is your chance! Voting takes place from February 15 -March 1, 2011. Please go to http://eatocracy.cnn.com/2011/02/15/food-wines-the-peoples-best-new-chef-2011-great-lakes/ and place your vote today!